The global refugee crisis brings up the importance of dialogue and integration, and highlights the balance between rights and responsibilities, while youth are being recognized as central to the debate. 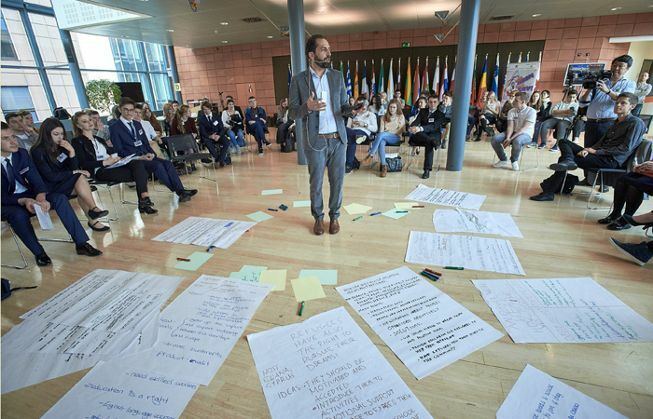 Students aged 16 and 17 recently took part in “Your Europe, Your Say!” (YEYS), organized by the European Economic and Social Committee (EESC). “Teenage refugees are the future ‘workers and geniuses’ in Europe, say YEYS delegates,” sums up the press release put out by the EESC today. The youth delegates exchanged views on how to promote a more integrated response to the migration crisis, and agreed on some overarching proposals to better integrate migrants, especially minors. In one of their decisions, they stand in favour of media reform in order to raise awareness and reduce discrimination. In another, they emphasize easing refugees into the education system. “A UK junior delegate said the EU should make an effort to put together teams of celebrities to promote tolerance of other cultures,” according to the press release. “A Serbian speaker felt Europe is not making best use of the migrants’ skills and qualifications,” it continues. Similar questions facing society were incorporated during a panel set up by the Montreal Intercultural Dialogue Institute last week, where youth were numerous in the audience. Meanwhile, the international “Photo Contest: Intercultural Dialogue from the Point of View of Youth” was implemented in the framework of the upcoming 7th Global Forum of the United Nations Alliance of Civilizations. The contest is looking for submissions by 14 to 29-year-olds on subjects such as education, migration, and media issues surrounding young people.